Move over Princess Elsa, a new girl is in town and she is super smart! GoldieBlox is hitting the toy shelves this month and she is amazing at solving puzzles and thinking outside the square. If your little person loves a story, problem solving and construction, GoldieBlox definitely has a well deserved spot on your toy shelf. GoldieBlox is a series of interactive books and constructive toy kits starring Goldie, a girl who loves inventing, problem solving and engineering solutions. We told you about this brilliant toy and its Kickstarter campaign almost two years ago. 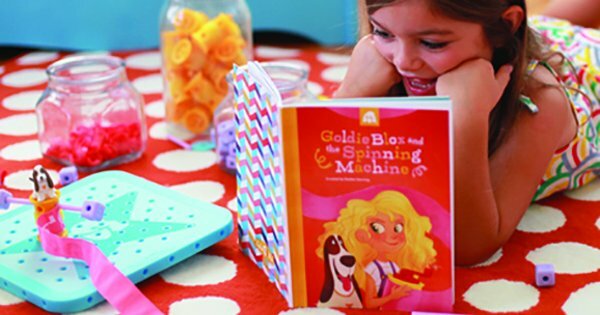 Now GoldieBlox finally launches in Australia this month with debut story GoldieBlox and the Spinning Machine, telling a tale of Goldie and her friends trying to help her dog Nacho, chase his tail. Not only a great read, but children can build a belt drive to spin everyone involved in the story and then have a fabulous time playing with it – there’s sixteen different design ideas to explore. A great toy for challenging children by building and developing confidence in problem solving, using science, technology and maths, all while having so much fun – they’ll barely notice they’re learning! 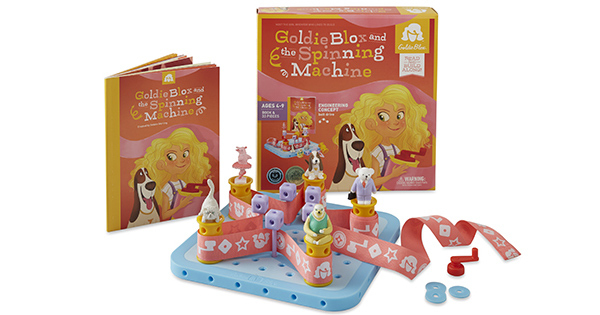 GoldieBlox and the Spinning Machine is priced $32 from Target, Kidstuff, Myer, National Geographic Store and all good toy retailers.